In December 1946 the American scientist Hermann Muller was awarded the Nobel Prize in Medicine “for the discovery of the production of mutations by means of X-ray radiation.” His research was conducted in the late 1920s when he studied the genetic effects on fruit flies – Drosophila melanogaster – exposed to extremely high X-ray doses which then led to the artificial transmutation of genes. Muller’s publications and subsequent research by Curt Stern in the late 1940s led to the development of the linear no-threshold (LNT) model with respect to genetic effects and carcinogenesis resulting from exposure to low-dose ionizing radiation. An important review paper that seeks to debunk the LNT model has just been published in the American Journal of Clinical Oncology. Jeffry Siegel and James Welsh, whose work we have previously featured, stated: “This model is used today to provide risk estimates for cancer resulting from any exposure to ionizing radiation down to zero dose, risk estimates that are only theoretical and, as yet, have never been conclusively demonstrated by empirical evidence.” They pointed out that all of us are literally bathed in background radiation every day with an annual exposure up to 250 mGy. By comparison, a woman receiving a digital mammogram is exposed to a dose of just 3 mGy. In their article, Siegel et al. provided a careful re-analysis of the original data on which the LNT model was built. 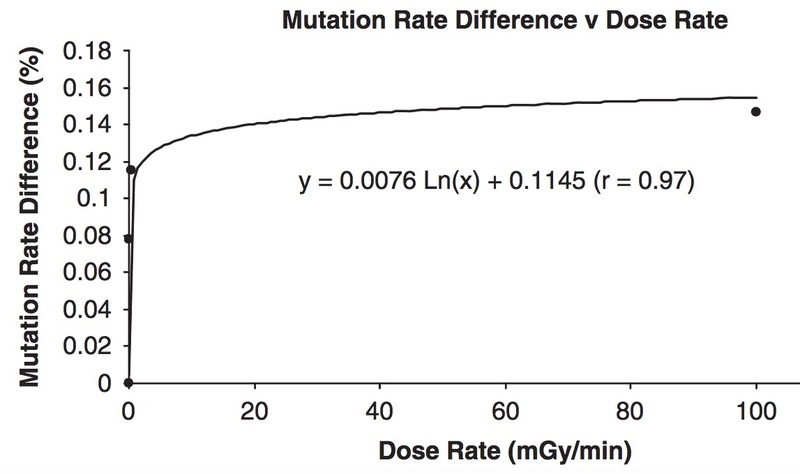 The data of Stern, linking the mutation rate difference (expressed as a percentage) has been plotted as a function of the dose rate (mGy per minute). As is evident from the accompanying graph seen below (© AJCO), the relationship is non-linear and exhibits a clear non-zero threshold. During the 1950s, in the aftermath of the atomic bombs that were dropped on Hisoshima and Nagasaki, the Biological Effects of Atomic Radiation panel was established by the US National Academy of Science to explore the link between radiation exposure and carcinogenesis. Again, Siegel and his colleagues showed that the data from the A-bomb survivors did not support the LNT model. They also drew the same conclusion from their analysis of 150,000 people who were exposed to radiation and evacuated from the vicinity of the Fukushima nuclear disaster in 2011. IN SPITE OF THIS ,CONTROVERSY WILL GO ON AND ON! WHAT SAY YOU PROFESSOR ED HENDRICKS??????? There is a lot of relevant and statistically trustworthy data collected in Ukraine in a state research program for studying the radiation impact from Chernobyl on living organisms in the Zone around the exploded reactor, which is active for 30 years now. In a nutshell, the ‘likely beneficial rather than harmful’ impact from low doses of additional radiation is exactly what have been reported on many occasions. Manifestation of this phenomenon ranges from disappeared infertility in women to re-appearance of the animal species, which were suggested extinct in the area.